Imagine coming home after a tough day, shutting the curtains and enjoying the latest movie hits in your own home cinema in Maidstone? Whether you’ve got an attic that you want to convert or just desire more from the home entertainment system in your living room, then the Home Media team can help. We’ve been installing beautiful visual masterpieces for years that offer our clients razor-sharp visuals and epic sound. With one of our fully-integrated home cinemas you will be able to flick into movie mode as soon as you come in by hitting a button, which will simultaneously set the ambience, shut the blinds or curtains and switch on the screen. 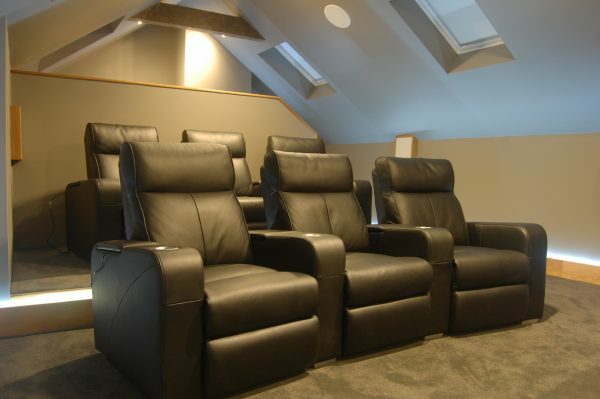 Give our friendly team a call on 01622 676703 if you just want to discuss your different options, or book in a time and date for our home cinema specialists to come round and design a bespoke system that fits perfectly in your home.